One of the more costly items to repair or replace in your home is your roof. No matter what type of system you have on your home, anytime you encounter problems, such as leaks, damage, or normal degradation, a roof repair can be expensive. If your roof is past its prime or suffered irreparable damage, you could be looking at roof replacement, a major financial undertaking. Shingles made of thinly cut slate. Virtually indestructible under normal conditions. Affordable and energy efficient. Made with thin sheets of metal. Most common in commercial settings, but popular for residential roofing as well. The primary job of any roof is to protect the structure and contents inside. Your roof takes plenty of abuse over its lifetime, no matter if it is asphalt, slate, shake, or metal. Standing up to the extreme seasonal changes in the eastern US can put stress on your roofing system, causing damage. A small leak, or missing shingle, can turn into a big job. Waiting won’t repair your roof and could end up costing you much more in the end. It’s not always necessary to get a new roof. You may be able to opt for replacement of the surface materials, such as missing shingles, or flashing. However, in some older homes, there could be multiple layers of asphalt shingles, signaling prior issues with leaks and damage. In that instance, a new roof would be your best option. The professionals at Dominion Roofing Co. have experience in all types of roof repair and replacement. We’ll keep you informed throughout our inspection, and advise you of the work we feel, in our professional opinion, you need. We’ll discuss available options, answer any questions you may have, and give you time to make an informed decision. Before contacting Dominion Roofing Co. to discuss repairing or replacing your roof, there are a few points you’ll need to consider. The appearance of your roof is indicative of the degree of damage. 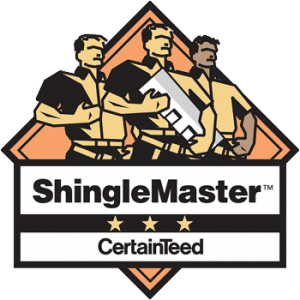 Should you notice several missing or broken shingles, ceiling stains or visible signs of water damage, you may want to replace your roof entirely. Depending on the age of your roofing system, repairing it may only put off the inevitable. Why invest in repairs for a roof that’s over 20 years old? Put that money toward a sturdy and reliable new roof instead. If you’re just maintaining your roof, and the maintenance and repair calls are more frequent, then a new roof is in order. Your next course of action is to determine the type of material for your new roofing system. Of course, there are several types of systems and several price points. Low-cost asphalt is common and lasts about 20 years. 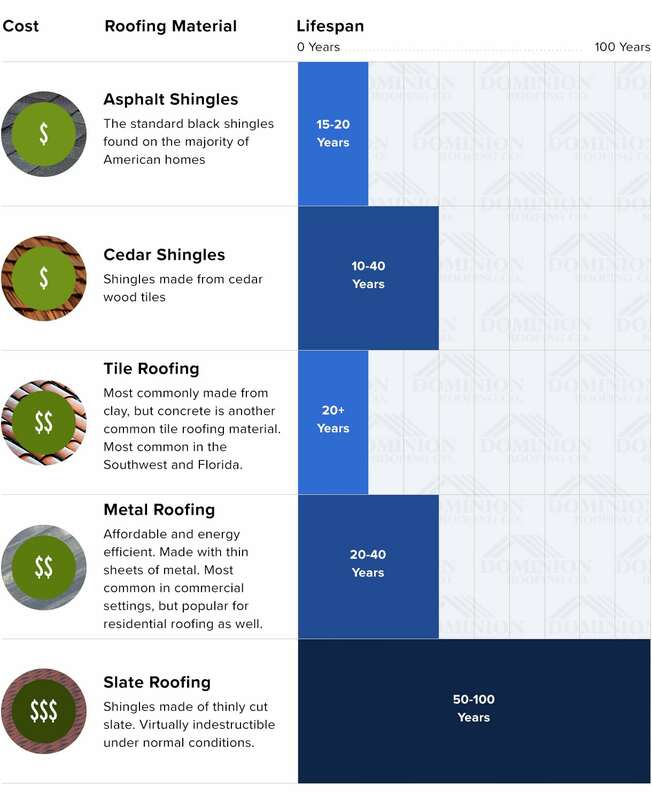 Wood shingles, typically made of cedar, are very sturdy, lasting up to 40 years. Clay or cement tile is quite heavy, and slightly more expensive, as your roof may need to be reinforced to accommodate the weight. They last more than 20 years. Slate tile roofing material is pretty much indestructible. It can be expensive, however, you probably won’t ever need to replace a slate roof. They have a lifespan of well over 30 years. Durable metal roofing is affordable, but not very practical for residential use. Schedule a Roofing Estimate Today! An expert roofing contractor can provide you with more information. If you’re in need of roof repair, or replacement, contact Dominion Roofing Co. today. Our free, no-obligation estimate can get you started.